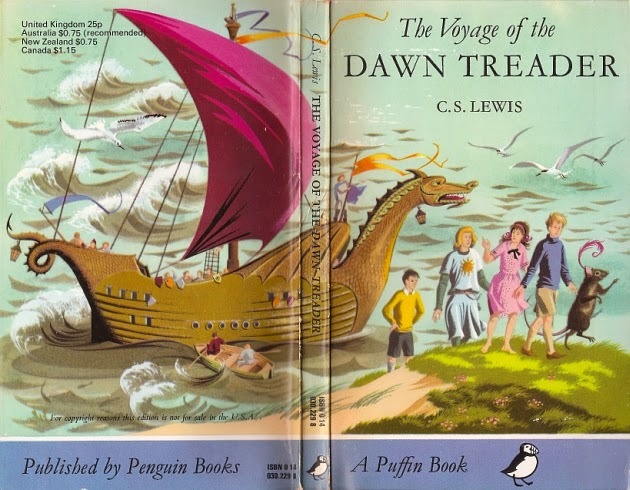 I nearly forgot to mention yet another scene in The Voyage of the Dawn Treader that adds to the reasons why it is one of my favorite books in the series. (Read the first two reasons here and here.) It is at the end of the book when the children have sailed all the way to the end of the world. You see, the world of Narnia is actually a flat world and not a round one like ours. As they draw closer and closer to "Aslan's country" the light becomes brighter, the water becomes wetter, "stronger than wine and somehow wetter, more liquid than ordinary water". They stopped needing to eat and sleep. Lewis tells us that the sailors who had been older men when the voyage began were now growing younger every day. Their eyesight grew sharper, like eagle's eyes. "They saw a wonder ahead. It was as if a wall stood up between them and the sky, a greenish-grey, trembling, shimmering wall. Then up came the sun, and at its first rising they saw it through the wall and it turned into wonderful rainbow colours. Then they knew that the wall was really a long, tall wave - a wave endlessly fixed in one place as you may often see at the edge of a waterfall. It seemed to be about thirty feet high, and the current was gliding them swiftly towards it. 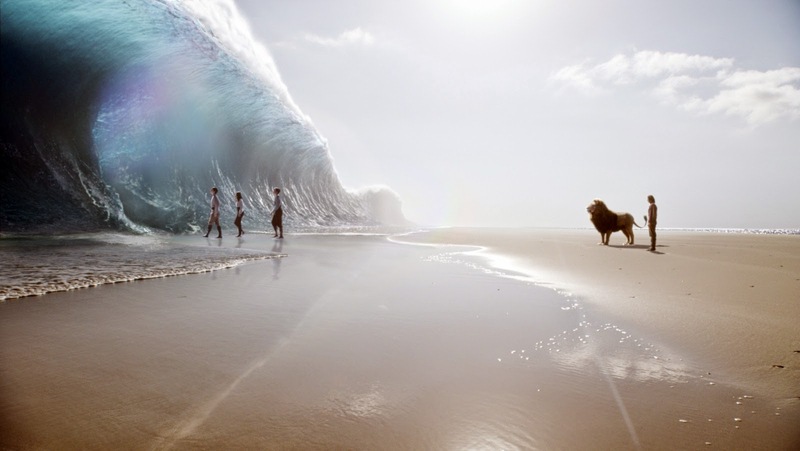 ... now they saw something not only behind the wave but behind the sun. They could not have seen even the sun if their eyes had not been strengthened by the water of the Last Sea. But now they could look at the rising sun and see it clearly and see things beyond it. What they saw - eastward, beyond the sun - was a range of mountains. It was so high that either they never saw the top of it or they forgot it. None of them remembers seeing any sky in that direction. And the mountains must really have been outside the world. For any mountains even a quarter of a twentieth of that height ought to have had ice and snow on them. But these were warm and green and full, of forests and waterfalls however high you looked. And suddenly there came a breeze from the east, tossing the top of the wave into foamy shapes and ruffling the smooth water all round them. It lasted only a second or so but what it brought them in that second none of those three children will ever forget. It brought both a smell and a sound, a musical sound Edmund and Eustace would never talk about it afterwards. Lucy could only say, "It would break your heart." "Why," said I, "was it so sad? " "Sad!! No," said Lucy. As I read the descriptions of what they are seeing, even from a distance, my heart beats faster as I long for "Aslan's country". "between them and the foot of the sky there was something so white on the green grass that even with their eagles' eyes they could hardly look at it. They came on and saw that it was a Lamb. "Come and have breakfast," said the Lamb in its sweet milky voice. "Please, Lamb," said Lucy, "is this the way to Aslan's country?" "What!" said Edmund. "Is there a way into Aslan's country from our world too?" "There is a way into my country from all the worlds," said the Lamb; but as he spoke his snowy white flushed into tawny gold and his size changed and he was Aslan himself, towering above them and scattering light from his mane." "I shall be telling you all the time," said Aslan. "But I will not tell you how long or short the way will be; only that it lies across a river. But do not fear that, for I am the great Bridge Builder. And now come; I will open the door in the sky and send you to your own land." I love it so much! "Notice the "I am" statement, reminiscent of Jesus's "I AM" statements in the book of John. But you shall meet me, dear one," said Aslan. "Are are you there too, Sir?" said Edmund.